They say you are only as strong as your weakest link. We don't have one. Since 1983, Hacker Industries, Inc. has served the construction industry as an innovator and leader in the development of cementitious floor underlayment products for new construction, renovation and repair. 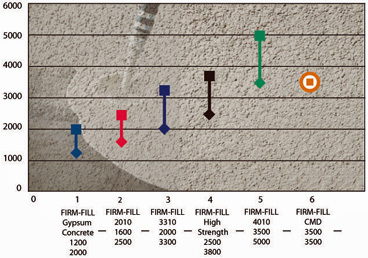 Our full line of FIRM-FILL Brand Gypsum Concretes meet virtually any project specification, with impressive compressive strengths ranging from 1200 to over 5,000 psi. No matter what the construction project requires, installation over wood, concrete, radiant tubes or corrugated metal deck, Hacker Industries supplies a high-quality and high-strength solution to meet the demand.